Reunions have become a requisite aspect of the music business, though the end results can vary in quality. 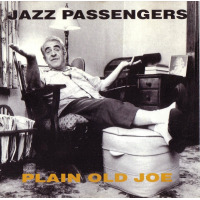 Reunited, The Jazz Passengers first recording in twelve years, is a stellar example of this phenomenon. 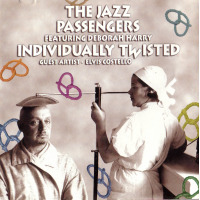 Picking up where they left off, this vivacious studio session juxtaposes mellifluous crooning, adventurous post-bop and stylistic eclecticism with irrepressible charm and sophisticated humor. Their all-inclusive embrace of multiple genres yields a hodgepodge of uncanny originals and surprising covers, executed with palpable enthusiasm. 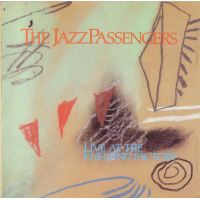 Featuring the return of guitarist Marc Ribot and guest appearances by Elvis Costello and Deborah Harry, Reunited recalls the Jazz Passengers Knitting Factory-era heyday, when their insouciant blend of absurdity and virtuosity provided a "real" jazz alternative for those raised on a steady diet of Lower East Side noise from luminaries like Arto Lindsay and John Zorn. More than a decade later, the band has lost none of its spirit, sounding as capricious now as in its prime. The harmonious verbal and instrumental interplay between trombonist Curtis Fowlkes and saxophonist Roy Nathanson continues to form the crux of the group's sound, supported by the cinematic ambiance of Bill Ware's effervescent vibes. Replacing original violinist Jim Nolet, Sam Bardfeld's sinuous cadences fuse old school swing with avant-garde experimentation, as the venerable rhythm section of bassist Brad Jones and drummer E.J. Rodriguez plies an assortment of infectious grooves. Elevating the proceedings, Ribot's edgy approach recalls his early days, when his startlingly oblique guitar solos as sideman to artists like Tom Waits and Elvis Costello were a revelation in the underground. Revisiting the unorthodox sounds he helped pioneer in the early nineties, Ribot delves into his old bag of tricks, using prepared objects, crushing distortion and scintillating reverb to invoke a kaleidoscopic array of timbres. The band's originals comprise a diverse cross-section of song craft, from the dramatic art song blues of "Wind Walked By" featuring Elvis Costello channeling "Brother Can You Spare a Dime?," to the ebullient R&B swagger of "Button Up." Demonstrating their range, "Tell Me" offers lush Latinized balladry, while "Seven" is a raucous exercise in labyrinthine counterpoint and rock attitude. Sashaying laconically through a Harry Partch-inspired soundscape of percolating tones, Fowlkes and Nathanson's surreal spoken word transformation of the Peaches and Herb classic, "Reunited" is fittingly cleverone of their strangest, funniest and most compelling covers. A faithful instrumental version of Radiohead's free jazz influenced "The National Anthem" returns the favor, while a joyfully lighthearted take on "Spanish Harlem" closes the studio portion of the record with witty repartee. Recorded live in 1995, two bonus tracks featuring Deborah Harry fall somewhat short in comparison to the album proper. As enjoyable as they are, their inclusion is hardly essential, as the band and Harry have covered this territory many times before, and to better effect. 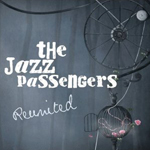 Despite the lightweight finale, Reunited is one of The Jazz Passengers strongest releases, rivaling their late-nineties outputit's great to have them back. Track Listing: Wind Walked By; Seven; Button Up; Reunited; The National Anthem; Tell Me; Spanish Harlem; Think Of Me; One Way Or Another. 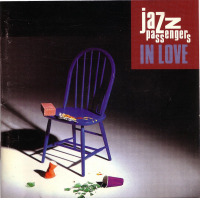 Personnel: Curtis Fowlkes: trombone, vocals; Roy Nathanson: alto and soprano saxophone, vocals; Bill Ware: vibes; Bradley Jones: bass, vocals; E.J. 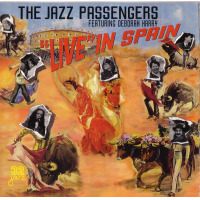 Rodriguez: drums (1-6, 8, 9); Sam Bardfeld: violin (1-7); Marc Ribot: guitar (1-6); Elvis Costello: lead vocal (1); Deborah Harry: vocals (8, 9); Susi Hyldgaard: lead vocal (7); Rob Thomas: violin (8, 9); Russ Johnson: trumpet (7); Tanya Kalmanovitch: viola (7); Ruben & Patricia Munne: intro dialogue (7).